Manila, Philippines - Lyric Opera of the Philippines and the Resorts World Manila to organize a special campaign for this year’s “Breast Cancer Awareness”. 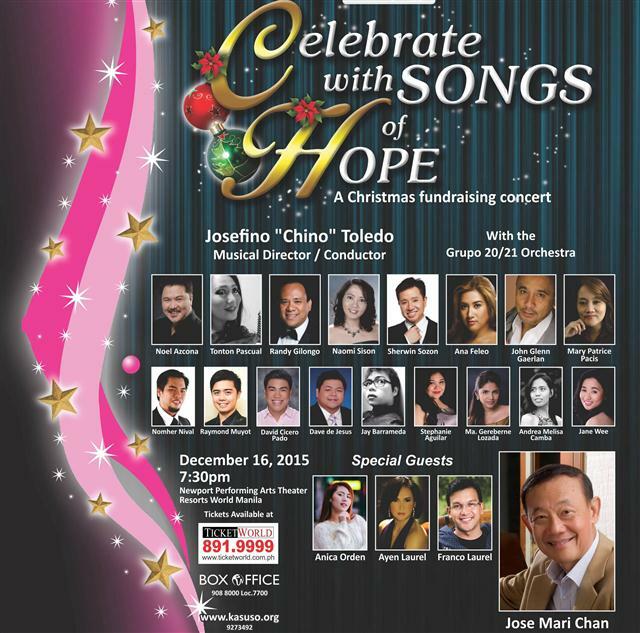 “Celebrate with Songs of Hope: A Christmas Fundraising Concert” will be held at the Newport Performing Arts Theater of Resorts World Manila on December 16, 2015. The event will start at 7:30pm as part of an ongoing campaign to fight Breast Cancer, a disease that has claimed thousands of lives over the years. The organizers aim to educate people about the symptoms of Breast Cancer, and what they can do to survive it. Each ticket you buy will send one Breast Cancer patient to much needed Chemotherapy Treatment. Tickets for the event are available at the Ticketworld and Philippine Foundation for Breast Cancer. Resorts World Manila (RWM) is a leisure and entertainment destination in the Philippines that showcases thrilling lifestyle choices, unique events, first-rate performances and recreational thrills. Strategically located near the Ninoy Aquino International Airport Terminal 3, it is a direct portal to the world-class hospitality of the Philippines. RWM is home to top-rated brands such as the Marriott Grand Ballroom, the Remington Hotel, the Marriott Hotel Manila, and Maxims Hotel. For more information, please visit www.rwmanila.com.